I read Weekly Famitsu magazine as usual this afternoon but there wasn't a single piece of news worth mentioning this time. There's no Weekly Famitsu next week due to the holiday season in Japan, so I guess we have to rely on the weekend events for Sengoku Basara 4 Sumeragi news until the regular updates resume in a fortnight. This means I have more time free than expected so I'll post a picture of the goodies I've been lucky enough to acquire recently. I backed the Time Of Eve (Eve No Jikan) Kickstarter a long time ago. So long ago, in fact, that I had forgotten I paid enough to earn two A4 prints and a fully-translated book about the series. 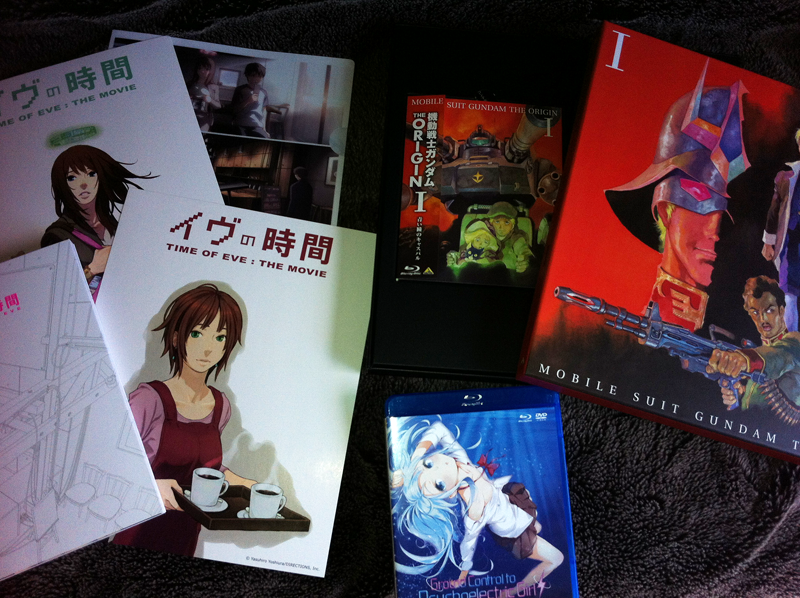 The actual Blu-ray disc shipped a while ago so it was a complete surprise when the extras turned up this week. The colour prints were safely protected by an attractive A4 clear file and delivered in the largest shipping box imaginable. My neighbour laughed as he handed over the package, asking whether I'd ordered a box full of air. The art book is lovely too. It's the kind of thing I'm used to seeing in Japanese but having all of the production notes and interviews translated for English-speaking fans is extremely rare. What a great Kickstarter project that was. The other big item is the first Blu-ray disc of the brand new Mobile Suit Gundam: The Origin series courtesy of UK distributor Anime Limited. The store-exclusive packaging can only be described as ostentatious; the stunningly-illustrated outer box is as large as a vinyl record even though all it contains is a Blu-ray case (in a slipcase, naturally), art cards and a storyboard book. I haven't seen the anime yet so I'm looking forward to checking it out. It's never going to fit on my shelves. 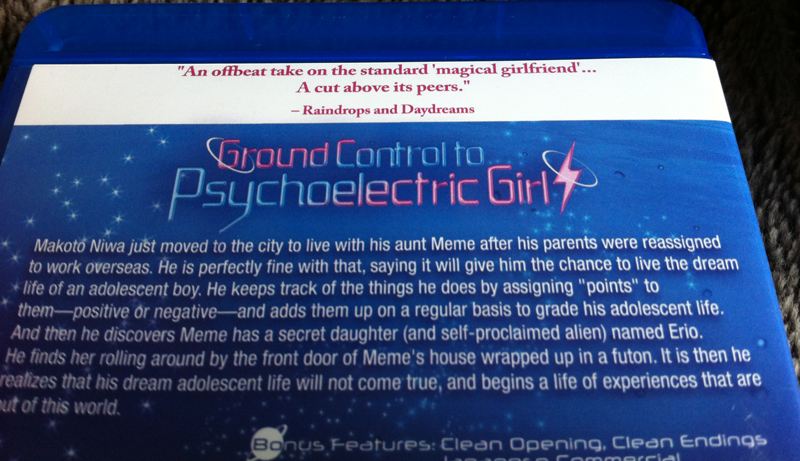 The final delivery in the picture is NIS America's standard edition rerelease of Ground Control To Psychoelectric Girl (Denpa Onna To Seishun Otoko). It actually arrived a little while ago and I completely forgot to mention it. I already own the limited edition version of the show so this was a vanity purchase for one reason alone. My review was quoted on the back! This blog was originally set up for anime-related ranting and reviews. I didn't get too far before posting about Sengoku Basara started consuming all of my free time, but it's a great feeling to have my blog's name on the packaging of a show I really loved. loved eve! I thought I was the only one who watched it!